Cassava is not really a “forgotten crop” in many parts of Africa, but because of the threat of climate change having a major impact on traditional crops - especially in the SADC region - we will discuss it here. In our region, many farmers still prefer to plant maize, millet and sorghum – all of which stand to suffer if the region becomes more drought-prone and more arid in the years to come. The reason is simple: Cassava offers climate change hope for Africa. Cassava is grown for its enlarged starch-filled roots, which contain nearly the maximum theoretical concentration of starch on a dry weight basis among food crops. Fresh roots contain about 30 percent starch and very little protein. Roots are prepared much like potato. They can be peeled and boiled, baked, or fried. 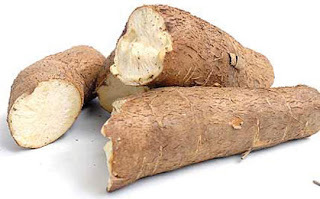 It is not recommended to eat cassava uncooked because of potentially toxic concentrations of cyanogenic glucosides that are reduced to innocuous levels through cooking. In traditional settings of the Americas, roots are grated and the sap is extracted through squeezing or pressing. The cassava is then further dried over a fire to make a meal or fermented and cooked. The meal can then be rehydrated with water or added to soups or stews. In Africa, roots are processed in several different ways. They may be first fermented in water. Then they are either sun-dried for storage or grated and made into a dough that is cooked. Alcoholic beverages can be made from the roots. Young tender leaves can be used as a potherb, containing high levels of protein. Prepared in a similar manner as spinach, care should be taken to eliminate toxic compounds during the cooking process. One clone with variegated leaves is planted as an ornamental. The perennial woody shrub, grown as an annual, was carried to Africa by Portuguese traders from the Americas. It is a staple food in parts for western and central Africa and is found throughout the humid tropics. The world market for cassava starch and meal is limited, due to the abundance of substitutes. Cassava is a major source of low-cost carbohydrates for populations in the humid tropics. The largest producers of cassava are Brazil, Thailand, Nigeria, the DRC and Indonesia. Production in Africa and Asia continues to increase, while that in Latin America has remained relatively level over the past 30 years. Cassava is famous for the presence of free and bound cyanogenic glucosides, linamarin and lotaustralin. They are converted to HCN in the presence of linamarase, a naturally occurring enzyme in cassava. Linamarase acts on the glucosides when the cells are ruptured. All plant parts contain cyanogenic glucosides with the leaves having the highest concentrations. In the roots, the peel has a higher concentration than the interior. In the past, cassava was categorised as either sweet or bitter, signifying the absence or presence of toxic levels of cyanogenic glucosides. Sweet cultivars can produce as little as 20mg of HCN per kg of fresh roots, while bitter ones may produce more than 50 times as much. The bitterness is identified through taste and smell. This is not a totally valid system, since sweetness is not absolutely correlated with HCN producing ability. In cases of human malnutrition, where the diet lacks protein and iodine, under-processed roots of high HCN cultivars may result in serious health problems. So says Andy Jarvis of the International Centre for Tropical Agriculture. The cassava plant could help African farmers cope with climate change, a recent scientific report says. Cassava performed best compared to potato, maize, bean, banana, millet, and sorghum. “It’s like the Rambo of the food crops,” report author Andy Jarvis, of the Colombia-based International Centre for Tropical Agriculture, notes. But the report also stresses the need for more research to make cassava more resistant to pests and disease. Cassava outperformed six other staple crops - potato, maize, bean, banana, millet, and sorghum - in 24 climate prediction models, the report says. The plant grows well in high temperatures and if drought hits it “shuts down” until the rains come again, the scientists say. “We have very few good stories where we see crops doing equal or better under climate change and finally we’ve found one with cassava,” Jarvis told the BBC’s Network Africa programme. For him, this is good news for Nigeria - Africa’s biggest grower - with “36-37 mega (million) tonnes of production every year”, and the DRC, the next largest producer. Cassava could be now a “fallback when other crops are failing”, Jarvis says. The root, rich in starch, is grown less in southern Africa, where there are cold temperatures during the winter months. But this could change, according to Jarvis. Thus, the seeds of prosperity for some rural Africans may lie in a crop that has sustained them with calories for centuries but has generated virtually no wealth for their poor countries. Cassava - with its starchy root used to make tapioca - thrives in Africa’s tropical climates, through drought or deluge, but maize and other crops have had distinct advantages over the hardy tuber. Until now. Cassava can remain in the soil for a couple of years but its main drawback has been that it has to be processed within 48 hours of harvesting or it spoils. An unlisted Dutch-based company called DADTCO has developed a processing method for cassava and dispatches a mobile unit with the equipment to rural villages, so farmers don’t have to harvest their crop until it arrives. The implications could be revolutionary on a continent where much economic activity still centres on small-scale farming. The potential has already been spotted by global brewer SABMiller which has started making beer from cassava in northern Mozambique. “This creates we believe a fly-wheel for commercial cassava production in Mozambique,” Mark Bowman, the brewer’s MD for Africa, told a recent Africa Investment Summit. “In the short-term 1 400 or 1 500 farmers benefit directly. We expect we can grow that up to 6 000 farmers as the product grows,” he said. DADTCO chief executive, Peter Bolt, told Reuters that similar projects are being rolled out in Zambia, Ghana and South Sudan with more to follow. “Our target is to roll out in 26 or 27 Sub-Saharan African countries in the next couple of years,” he said. And it’s not only brewers that are focusing on cassava. Unilever, the Anglo-Dutch consumer goods giant, is targeting the root to make sorbitol, a key ingredient in toothpaste and other products. Unilever and some of its business partners are currently in talks about investing in a starch complex to process cassava into starch or sorbitol in Nigeria, which is the world’s biggest producer of the root and a big market for Unilever’s three billion euro a year Africa business. “We are already in exploratory talks to source (110 231 tonnes) of cassava per year for processing in Africa into sorbitol for use in our oral care products like toothpaste,” said Frank Braeken, Unilever’s executive vice president for Africa. It remains to be seen how far the “cassava revolution” can go but it surely raises new hope on the economic and food security fronts for the world’s poorest continent. When it comes to pure sustenance and survival, cassava is hard to beat because of its durability, even if maize and other staples generally have higher starch contents. According to the International Institute of Tropical Agriculture, 37 percent of Africa’s dietary energy comes from cassava and per capita consumption on the continent is close to 80kg per year. But instead of being grown primarily for household consumption, expect more cassava to be stored in the ground for eventual sale.